Not to be confused with Building cooperative. "Housing society" redirects here. For the organizations in the United Kingdom and Ireland, see Housing association. 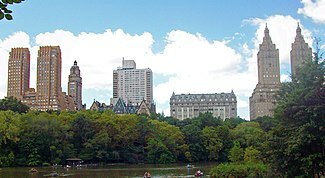 Housing cooperatives on Central Park West in Manhattan, New York City, from left to right: The Majestic, The Dakota, The Langham, and The San Remo. 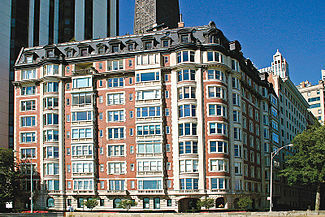 999 N. Lake Shore Drive, a co-op owned residential building in Chicago, Illinois, United States. A housing cooperative, co-op, or housing company (especially in Finland), is a legal entity, usually a cooperative or a corporation, which owns real estate, consisting of one or more residential buildings; it is one type of housing tenure. Housing cooperatives are a distinctive form of home ownership that have many characteristics that differ from other residential arrangements such as single family home ownership, condominiums and renting. The corporation is membership-based, with membership granted by way of a share purchase in the cooperative. Each shareholder in the legal entity is granted the right to occupy one housing unit. A primary advantage of the housing cooperative is the pooling of the members' resources so that their buying power is leveraged, thus lowering the cost per member in all the services and products associated with home ownership. Another key element in some forms of housing cooperatives (but not Finnish housing companies, for example) is that the members, through their elected representatives, screen and select who may live in the cooperative, unlike any other form of home ownership. Housing cooperatives fall into two general tenure categories: non-ownership (referred to as non-equity or continuing) and ownership (referred to as equity or strata). In non-equity cooperatives, occupancy rights are sometimes granted subject to an occupancy agreement, which is similar to a lease. In equity cooperatives, occupancy rights are sometimes granted by way of the purchase agreements and legal instruments registered on the title. The corporation's articles of incorporation and bylaws as well as occupancy agreement specifies the cooperative's rules. The word cooperative is also used to describe a non-share capital co-op model in which fee-paying members obtain the right to occupy a bedroom and share the communal resources of a house that is owned by a cooperative organization. Such is the case with student cooperatives in some college and university communities across the United States. As a legal entity, a co-op can contract with other companies or hire individuals to provide it with services, such as a maintenance contractor or a building manager. It can also hire employees, such as a manager or a caretaker, to deal with specific things that volunteers may prefer not to do or may not be good at doing, such as electrical maintenance. However, as many housing cooperatives strive to run self-sufficiently, as much work as possible is completed by its members. In non-equity cooperatives and in limited equity cooperatives, a shareholder in a co-op does not own real estate, but a share of the legal entity that does own real estate. Co-operative ownership is quite distinct from condominiums where people own individual units and have little say in who moves into the other units. Because of this, most jurisdictions have developed separate legislation, similar to laws that regulate companies, to regulate how co-ops are operated and the rights and obligations of shareholders. Each resident or resident household has membership in the co-operative association. In non-equity cooperatives, members have occupancy rights to a specific suite within the housing co-operative as outlined in their "occupancy agreement", or "proprietary lease", which is essentially a lease. In ownership cooperatives, occupancy rights are transferred to the purchaser by way of the title transfer. Since the housing cooperative holds title to all the property and housing structures, it bears the cost of maintaining, repairing and replacing them. This relieves the member from the cost and burden of such work. In that sense, the housing cooperative is like the landlord in a rental setting. However, another hallmark of cooperative living is that it is nonprofit, so that the work is done at cost, with no profit motive involved. In some cases, the co-op follows Rochdale Principles where each shareholder has only one vote. Most cooperatives are incorporated as limited stock companies where the number of votes an owner has is tied to the number of shares owned by the person. Whichever form of voting is employed it is necessary to conduct an election among shareholders to determine who will represent them on the board of directors (if one exists), the governing body of the co-operative. The board of directors is generally responsible for the business decisions including the financial requirements and sustainability of the co-operative. Although politics vary from co-op to co-op and depend largely on the wishes of its members, it is a general rule that a majority vote of the board is necessary to make business decisions. In larger co-ops, members of a co-op typically elect a board of directors from amongst the shareholders at a general meeting, usually the annual general meeting. In smaller co-ops, all members sit on the board. A housing cooperative's board of directors is elected by the membership, providing a voice and representation in the governance of the property. Rules are determined by the board, providing a flexible means of addressing the issues that arise in a community to assure the members' peaceful possession of their homes. In the lifecycle of buildings, the replacement of assets (capital repairs) requires significant funds which can be obtained through a variety of ways: assessments on current owners; sales of Treasury Stock (former rental units) to new shareholders; draw downs of reserves; unsecured loans; operating surpluses; fees on the sales of units between shareholders and new and increases to existing mortgages. There are housing co-ops of the rich and famous: John Lennon, for instance, lived in The Dakota, a housing co-operative, and most apartments in New York City that are owned rather than rented are held through a co-operative rather than via a condominium arrangement. There are two main types of housing co-operative share pricing: market rate and limited equity. With market rate, the share price is allowed to rise on the open market and shareholders may sell at whatever price the market will bear when they want to move out. In many ways market rate is thus similar financially to owning a condominium, with the difference being that often the co-op may carry a mortgage, resulting in a much higher monthly fee paid to the co-op than would be so in a condominium. The purchase price of a comparable unit in the co-op is typically much lower, however. With limited equity, the co-op has rules regarding pricing of shares when sold. The idea behind limited equity is to maintain affordable housing. A sub-set of the limited equity model is the no-equity model, which looks very much like renting, with a very low purchase price (comparable to a rental security deposit) and a monthly fee in lieu of rent. When selling, all that is re-couped is that very low purchase price. Housing co-ops in Canada have many different organizational forms. In Ontario, there are co-ownership, equity and occupant-run co-ops. In Alberta, housing co-ops are either non-equity (also referred to as "continuing co-ops") and ownership (also referred to as "strata-title co-ops"). Given that each Province has different legislation under which co-operative housing communities are incorporated and organized, descriptions of the different ownership housing co-op forms pertain often only to the Province in which they exist. Non-equity continuing housing co-operatives exist in all provinces and territories and share common features. They can be any housing form: single detached, duplex, town-home and apartment. Their main common denominator is that once built and occupied, the co-op continues to own 100% of the units and each member/shareholder is entitled to occupy a home on the basis of some form of contract or housing agreement. Members pay a monthly fee which covers all of the co-op's costs including mortgage payments, taxes, operating costs and building replacement reserve fund allocations. In Alberta, ownership co-ops were introduced in 1987 with the building of a twin high-rise tower development in Edmonton (Riverwind Strata Title Housing Co-operative). Subsequently ownership co-ops have been developed and built in other urban centres such as Calgary, Fort Saskatchewan, Canmore and Banff. The individual units within these co-op developments are sub-divided by using the strata title provision of the Land Titles Act, thus creating individual three-dimensional strata lots. This strata sub-division is registered at Land Titles, thus creating "air" lots which have the same properties as more commonly known two-dimensional land lots. In this fashion, co-op members can purchase their individual units and can register a mortgage on title. Like the continuing co-op's, ownership co-op's can be any housing form. Strata lots in Alberta are not to be confused with strata lots in British Columbia. Co-ownership co-ops are generally older apartment buildings, incorporated before the Ontario Condominium Act, 1973 came into existence, where shareholders each own one voting share in the corporation that owns the building and have a registered right to occupy individual units as described on their share certificate. Most of these types of co-ops date from the thirties, forties and fifties and are located in the City of Toronto. They are similar to condominiums, in that units may be bought and sold by private sale or on the open market. Until relatively recently, these units tended to be bought by older people with home equity who could buy the unit outright, as it was difficult to get a mortgage against these units. However, a number of Ontario credit unions are now offering limited financing, provided that that individual co-op corporations meet their fiscal standards, making these units affordable housing options for younger buyers. Incoming owners must be approved by the building's Board of Directors, and agree to abide by building by-laws and Occupancy Agreements. Equity co-ops are buildings in which individuals purchase a percentage share of the building and the land on which it is built tied to the square footage of their unit; all owners own the building collectively, with exclusive rights to occupy their own unit. More credit unions will offer financing against them than against co-ownerships. They are a relatively new form of construction, designed to encourage owner occupancy by having the building's corporation hold back a percentage of the unit's share equity to ensure owner occupancy. This legal structure is used as an alternative to condominium registration, either when the government will not allow conversion of an existing apartment building to a condominium, or to avoid the expense and difficulty of doing so. Then there are co-ops that provide all the privileges of ownership except for the right to make (or lose) money on a primary residence and are run by the people who live there. The federal and provincial governments in Canada developed legislation in the 1970s that assisted new housing co-ops by providing start-up funding and financing through mortgages insured by the Canada Mortgage and Housing Corporation (CMHC), a federal government agency. The government simultaneously began to encourage the development of co-operative development resource groups to contract with fledgling boards of directors of housing co-ops to develop co-operatives in existing multi-residential properties, in turnkey buildings or buildings designed and constructed by architects and builders with which the board contracted to deliver the service. Supervised by the board, the resource groups marketed the units to suitable members, educated them about their rights and obligations as co-operators, and established a management structure which usually included co-op employees or property management companies. Resource groups helped in forming initial policies and holding the organization together as the co-operative was developed and occupied. The federal government tied its loan assistance to requirements that these housing co-ops provide a percentage of their units, usually at least 15 to 20 per cent, for what are termed income-tested residents. These people voluntarily provide information to the co-op on a confidential basis about their gross income, and their monthly housing charge (rent)is then calculated according to a formula. If the calculated charge is less than the market rent of the units, then the federal government, through another formula, would provide funding to those units to bring their unit revenue up to the market rate. This produced mixed-income co-op housing, in which relatively well-off people lived side-by-side with relatively low-income people and worked with them on committees. This often had the ripple effect of improving the financial health of those less well-off. Depending on one's political point of view, such government payments for offsetting the housing charge could be considered a subsidy of the low-income members, or a contractual business arrangement between the government and the co-op, which helps to stabilize revenue to the co-op in exchange for accomplishing a social goal for the government for a specific period. This dichotomy is typical of the fact that a housing co-op is somewhere between a private business corporation and a social agency, and where one places it depends on one's viewpoint—and the collective viewpoint of each housing co-op. Some observers would now simply categorize these co-op as a form of social enterprise. Political will dissipated in Canada in the 1990s, however, as other issues occupied politicians and financial belt-tightening by the governments reduced the funds available for the mortgages. In 2004 and 2005, however, the political winds shifted back towards the idea of developing more low-income housing. However, not-for-profit housing co-operatives are committed to the mixed-income concept and have not been able to make much use of the few opportunities that have come available in recent years. Also, the term of many of the government agreements concerning funding for housing subsidies are coming to an end, provoking a debate in individual co-ops and the co-op movement on the extent to which co-ops should continue to be mixed-income forms of housing. In Canada, there are number of secondary and tertiary associations of housing co-operatives. The major national organization is the Co-operative Housing Federation of Canada (CHF Canada). Most provinces have similar organizations for their area, but many are stand-alone members of the CHF Canada, as opposed to being branches of it. Each such organization charges its member co-operatives a fee based on the number of housing units in the co-op to pay for staff to do its work. This includes advocacy to governments, setting up self-help funding and the like. These organizations do not act for individual members, and do not give members advice when the member encounters problems with the Board of their co-op. In most jurisdictions there are no organizations for members of housing co-operatives, in contrast with tenants in a traditional landlord-and-tenant relationship, who can be assisted by various tenant advocacy groups. In Ontario, the eviction of members of a housing co-operative is governed by special section of legislation set out in the Co-operative Corporations Act. Prior to a formal hearing to terminate a member's occupancy some co-operatives issue a "Notice of Concern" to request the member to attend a Board of Directors meeting to attempt to resolve an issue of arrears or other behaviour contravening the co-operative's Occupancy By-law. If the Board of Directors of the co-operative cannot resolve the member issue, which is a cause for possible termination of occupancy rights, it can pass a motion to send the member a notice to appear requiring the member to attend at a Board meeting at which the termination (eviction) of that member's occupancy will be considered. If the Board votes to terminate an occupancy (evict), the member has a right of appeal to the membership as a whole. In order to enforce the eviction, the Board must bring an application to a judge of the Superior Court, on which occasion the member has the opportunity to present his/her case to the judge; the judge considers whether the eviction process was conducted fairly and in accordance with due process, and has a residual discretion to refuse the eviction should the judge consider it fair to do so, notwithstanding the decision of the Board. Sometimes this hearing is conducted like a trial, with oral evidence from both sides, while at other times it is conducted based only on written documents submitted to the court; the practice varies from judge-to-judge and courthouse to courthouse, and there is no consensus on the proper procedure or what right a member has to be heard. This process is different from evictions of rental tenants, which proceed in Ontario before a specialized tribunal and in which the tenant is always entitled to an oral hearing. The standard of deference that judges should show to the decisions of Boards is a controversial and unresolved issue in the law, with various cases taking seemingly inconsistent positions on the issue. As of 2012 new provincial legislation in Ontario will allow housing co-operatives to apply to a special tribunal to obtain a "writ of possession" to evict a member from their unit. A co-operative housing community can take many forms: a traditional apartment building, scattered single family homes, townhouses or it can be the basis of an intentional community or a "living co-op". Student housing co-operatives also can be found in many parts of Canada including Kingston, Guelph, Waterloo and Toronto, Ontario; New Westminster, British Columbia; Edmonton, Alberta; Winnipeg, Manitoba; Montreal, Quebec; and Fredericton, New Brunswick. "Building co-operatives" ("self-build housing co-operatives" in British parlance, which distinguishes them from worker co-operatives in the building trade) are formed by members who co-operate to build their homes but own their houses on completion. Some co-ops continue to own common elements such as roads, parks, water systems, etc. Building co-ops were extremely popular across Canada from the 1930s to the 1960s. Father Jimmy Tompkins helped to pioneer this concept at Tompkinsville at Reserve Mines on Cape Breton Island in Nova Scotia. In Finland holding shares in a housing company is a common form of real estate and home ownership. Owning an apartment in Finland usually means owning shares in a housing company; ownership of a certain set of shares in turn confers the right to use a certain part of the building owned by the company. Except for a very limited number of co-ops that follow the strict Rochdale Principles of one vote, all Finnish housing cooperatives are incorporated as (non-profit) limited-liability companies (Finnish: asunto-osakeyhtiö, Swedish: bostadsaktiebolag), where one share usually represents one square meter of the apartment, but may represent the whole apartment. Housing companies are regulated by Finnish law as a particular type of corporation. Housing company shares typically trade on the open market, most often through real estate agents. No board approval is needed to buy shares. In some older companies existing share holders have the right of pre-emption, i.e. the right to buy the shares at the set market price. There is usually no requirement for share holders to live in the co-operative. Owning apartments for rent is a common form of saving and private investment. There may be provisions against owning shares for more than one apartment in the same co-op. The first housing cooperatives were built around 1900, many of them in the Helsinki neighborhood of Katajanokka, in the national romantic Jugend style. Initially many co-ops were set up by the future members themselves, often workers or artisans in the same trade. By the 1920s co-op founding was the business of professional real estate developers. After World War II nationwide non-profit developer organizations were formed and a system of government provided loans (ARAVA) was introduced. Sale of shares in housing companies with state loans were restricted by limited equity rules for 50 years, the price of the shares was limited by an index. The Finnish model of the housing company was also the basis of the modern U.S. co-ops, as the first cooperative, the Finnish Home Building Association in Finntown (Brooklyn, New York), was started in 1918 by Finnish immigrants. In 2013, the opening of La Maison des Babayagas, an innovative housing co-op in Paris, gained world-wide attention. It was formed as a self-help community and built with financial assistance from the municipal government, specifically for female senior citizens. Located in the Paris suburb of Montreuil after many years of planning, it looks like any other apartment building. The senior citizens stay out of nursing homes, by staying active, alert, and assisting one another. The purpose of the Baba Yaga Association is to create and develop an innovative lay residence for aging women that is: (1) self-managed, without hierarchy and without supervision; (2) united collective, with regard to finances as well as daily life; (3) citizen civic-minded, through openness to the community /city and through mutual interaction, engaging in its political, cultural and social life in a spirit of participatory democracy; (4) ecological in all aspects of life, in conformity with the values and actions expressed in the Charter of Living of the House of Babayagas. Generally, the association's activities are tied to the purpose above, in particular the development of a popular entity called the University of Knowledge of the Elderly (UNISAVIE: Université du savoir des vieux), and the initiation of a movement to promote other living places that are organized into similar networks. The community charter sets out expectations for privacy. Each apartment is self-contained. Monthly meetings assure the optimal routines of the building and ensures that each person may participate fully and with complete liberty of expression. Plans set out the routine intervention of a mediator who could help get to the bottom of the causes of eventual conflicts in order to allow for their resolution. The success of the Paris co-op inspired several Canadian grassroots groups to adopt similar values in senior housing initiatives; these values include autonomy and self-management, solidarity and mutual aid, civic engagement, and ecological responsibility. In the Industrialisation in the 19th century there were many housing cooperatives founded in Germany. Presently, there are over 2,000 housing cooperatives with over two million apartments and over three million members in Germany. The public housing cooperatives are organised in the GdW Bundesverband deutscher Wohnungs- und Immobilienunternehmen (The Federal association of German housing and real estate enterprise registered associations). In India most 'flats' are owned outright. i.e. the title to each individual flat is separate. There is usually a governing body/society/association to administer maintenance and other building needs. These are comparable to the Condominium Buildings in the USA. The laws governing the building, its governing body and how flats within the building are transferred differ from state to state. Certain buildings are organized as "Cooperative Housing Societies" where one actually owns a share in the Cooperative rather than the flat itself. This structure was very popular in the past but has become less common in recent times. Most states have separate laws governing Cooperative Housing Societies. A housing corporation (woningcorporatie) is a nonprofit organization dedicated to building and maintaining housing for rent for people with lower income. The first housing corporations started in the second half of the 19th century as small cooperative associations. The first such association in the world, VAK ("association for the working class") was founded in 1852 in Amsterdam. Between 2.4 and 2.5 million apartments in the Netherlands are rented by the housing corporations, i.e. more than 30% of the total of household dwellings (apartments and houses). A (house) owners' association (Vereniging van Eigenaren, VvE) is by Dutch law established wherever there are separately owned apartments in one building. The members are legally owners of their own apartment, but have to cooperate in the association for the maintenance of the building as a whole. In the Philippines, a tenant-owner's association is often used as a means to buy new flats. When the cooperative is created, it takes the major part of the loan needed to buy the property. These loans will then be paid off during a fixed periods of years (typically 20-30), and once this is done, the cooperative is dispersed and the flats are transformed into condominiums. A tenant-owner's association (Swedish: bostadsrättsförening, Norwegian: borettslag, Danish: andelsboligforening) is a legal term used in the Scandinavian countries (Sweden, Denmark, and Norway) for a type of joint ownership of property in which the whole property is owned by a co-operative association, which in its turn is owned by its members. Each member holds a share in the association that is proportional to the area of his apartment. Members are required to have a tenant-ownership, which represents the apartment, and in most cases live permanently at the address. There are some legal differences between the countries, mainly concerning the conditions of ownership. Tenant-owner's associations were established during the 19th century and were originally a United Kingdom-based concept (building societies). The market price of existing tenant-ownership shares is often very high, normally much higher than the original stake price. In Sweden, 16% of the population lives in apartments in housing cooperatives, while 25% live in rented apartments (more common among young adults and immigrants) and 50% live in private one-family houses (more common among families with children), the remainder living in other forms such as student dormitories or elderly homes. In Switzerland 5.1% of all housing units are in cooperatives. The Schweizerischer Verband für das Wohnungswesen (Swiss cooperative housing federation) represents around 1,500 housing cooperatives with about 160,000 housing units. Housing co-operatives are uncommon in the UK, making up about 0.1% of housing stock. Most are based in urban areas and consist of affordable shared accommodation where the members look after the property themselves. Waiting lists can be very long due to the rarity of housing co-operatives. In some areas the application procedure is integrated into the council housing application system. The laws differ between England and Scotland. The Confederation of Co-operative Housing provides information on housing cooperatives in the United Kingdom and has published a guide on setting them up. The Shelter website provides information on housing and has information specific to England and Scotland. The Catalyst Collective provides information about starting co-operatives in the UK and explains the legal structure of a housing coop. Radical Routes offers a guide on how to set up a housing co-operative. Factors of raising cost of living for students and quality of accommodation have led to a drive for Student Housing Co-operatives within the UK inspired by the existing North American Student Housing Cooperatives and their work through North American Students of Cooperation. Edinburgh Student Housing Co-operative and Birmingham Student Housing Co-operative opened in 2014 and Sheffield Student Housing Co-operative in 2015. All existing Student Housing Co-operatives are members of Students for Cooperation. In the United States, housing co-ops are usually categorized as corporations or LLCs and are found in abundance from Madison, Wisconsin to the Greater New York metropolitan area. There are also a number of cooperative and mutual housing projects still in operation across the US that were the result of the purchase of federal defense housing developments by their tenants or groups of returning war veterans and their families. These developments include seven of the eight middle-class housing projects built by the US Government between 1940-42 under the auspices of the Mutual Ownership Defense Housing Division of the Federal Works Agency. There are many regional housing cooperative associations, such as the Midwest Association of Housing Cooperatives, which is based in Michigan and serves the Midwest region, covering Ohio, Michigan, Indiana, Illinois, Wisconsin, Minnesota, and more. The National Association of Housing Cooperatives (NAHC) represents all cooperatives within the United States who are members of the organization. This organization is a nonprofit, national federation of housing cooperatives, mutual housing associations, other resident-owned or controlled housing, professionals, organizations, and individuals interested in promoting the interests of cooperative housing communities. NAHC is the only national cooperative housing organization, and aims to support and educate existing and new cooperative housing communities as the best and most economical form of homeownership. NASCO, or North American Students of Cooperation, is an organization founded in 1968 that has helped organized cooperative living for students. With a presence in over 100 towns and cities across North America, NASCO has provided tens of thousands of students with sustainable housing. Cooperatives have a long history in Metropolitan New York – in November 1882, Harper's Magazine describes several cooperative apartment buildings already in existence, with plans to build more – and can be found throughout New York City, Westchester County, which borders the city to the north, and towns in New Jersey that are immediately across the Hudson River from Manhattan, such as Fort Lee, Edgewater, or Weehawken. Inspired by Abraham Kazan, cooperatives appeared at least as far back as the 1920s while a legal basis for condominium form of ownership was not available in New York State until 1964. Passage of the Condominium Act then opened a wave of construction of condominium buildings. The cooperative form can be advantageous as a building mortgage can be carried by the cooperative corporation, leaving less financing to be obtained by each co-op owner. Under condominium ownership only the separate condo owners provide financing. Particularly when interest rates are high, a conversion sponsor may find unit buyers more easily under the cooperative arrangement as buyers will have less financing to arrange on their own; the apparent purchase price of a unit in a cooperative building holding an underlying mortgage is lower than a condo purchase. Cooperative unit buyers may not accurately weigh their share of the building's mortgage. Also, later in a building's life after conversion, major new investments required to repair or replace building systems can be raised by a new central mortgage in a cooperative, while in a condominium funds could only be raised by onerous assessments being required of each individual unit owner. However, New York's condominium law was amended in 1997 to allow condominium associations to borrow money. The 1974 creation and then subsequent influence on policy by the Urban Homesteading Assistance Board, a housing advocacy group, which enabled the conversion of over 1,600 foreclosed, city-held rentals into limited-equity, resident-controlled co-ops. A co-op building's board can exercise its own business discretion to impose restrictions on shareholders, and reject prospective purchasers without explanation, as long as the board does not violate federal and state housing or civil rights laws. Most of the housing cooperatives in the Greater New York area were converted to that status during the 1980s; generally they were large buildings built between the 1920s and 1950s that a single landlord or corporation owned and rented out that became unprofitable as rental properties. To encourage individual ownership of units, the initial buyers of units (buying from the owner of the entire building) did not have to be approved by a board. Also, the rental tenants living in the building at the time of the conversion were usually given an option to buy at a discount. If the tenants were rent controlled, the law usually protects them by allowing them to stay as renters and the unit may not be occupied by a purchaser until said tenant dies or moves out. Many of these buildings, especially in Manhattan, are actually quite luxurious and exclusive; many celebrities live in them and some famous people are even rejected by co-op boards. In the 1990s and 2000s some rental buildings in the Chicago, Washington, D.C., and Miami-Fort Lauderdale-West Palm Beach areas went through a similar conversion process, though not to the degree of New York. Many of the cooperatives originally built as co-ops were sponsored by trade unions, such as the Amalgamated Clothing Workers of America. One of the largest projects was Cooperative Village in Lower East Side of Manhattan. The United Housing Foundation was set up in 1951 and built Co-op City in The Bronx, designed by architect Herman Jessor. One of the first subsidized, fixed-value cooperatives was Morningside Gardens in Manhattan's Morningside Heights. Another dynamic also contributed to the large number of cooperatives established in the 1980s and 1990s in New York City – in this case by low- and moderate-income tenant groups. In the 1970s, many New York City private landlords were struggling to maintain their aging properties in the face of high interest rates, redlining, white flight and rising fuel costs. The period also saw some landlord-induced arson to obtain insurance proceeds and widespread non-payment of real estate taxes – over 20% of multi-family residential properties were in arrears in the mid-1970s. In 1977, the city passed Local Law #45, which allowed the city to begin foreclosure proceedings after just one year of non-payment of taxes, not three, resulting in the takeover of thousands of buildings, many of them occupied, by the city of New York through a legal action known as an in rem foreclosure. In September 1978, the city's housing agency, the New York City Department of Housing Preservation and Development (HPD), created a series of new housing programs designed to give building residents and community groups control and eventual ownership of in rem buildings. The Urban Homesteading Assistance Board (UHAB), established in 1974, began to assist residents of these buildings to manage, rehabilitate and acquire their buildings, and form limited-equity housing co-operatives. Working with the city's housing agency, its existing loan programs and the power to dispose of abandoned property to non-profit organizations, as well as the state laws governing the establishment of co-operatives, UHAB was able to provide low-income people with the tools – seed money, legal advice, architectural plans, bookkeeping training – to build and run limited-equity housing co-operatives. Through a long-standing contract with the city to provide training and technical assistance to residents of buildings in the Tenant Interim Lease (TIL) Program, UHAB has worked with more than 1,600 coops, preserving over 30,000 units of affordable housing. Some cooperatives in New York City do not own the land upon which their building is situated. These are known as "Land Lease Buildings" and often have significant drawbacks for cooperative owners. Keep Cottage, one of the eight co-ops in the Oberlin Student Cooperative Association. Student cooperatives provide housing and dining services to those who attend specific educational institutions. 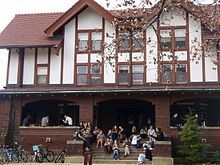 Some notable groups include Berkeley Student Cooperative, Santa Barbara Housing Cooperative and the Oberlin Student Cooperative Association. ^ "Asunto-osakeyhtiö" in Finnish, most similar to "bostadsrättsförening" in Sweden today, where the term and organizations called "bostadsaktiebolag" are nowadays rare, but they are still very common in Swedish in Finland. ^ a b c "The Characteristics of Housing Cooperatives". Retrieved 2 May 2015. ^ "A New York Co-op Apartment Lawyer: Co-op Boards, Shareholders, Managing Agents, and Commercial Tenants". Retrieved 2 May 2015. ^ "Condo vs. Co-op Apartment: The New York City Real Estate Question for Buyers, Sellers and Investors". Retrieved 2 May 2015. ^ Co-operative Corporations Act, R.S.O. 1990, Chapter C.35: Non-Profit Housing Co-Operatives. Retrieved 14 March 2010. ^ Sazama, Gerald W. (2000). "Lessons from the History of Affordable Housing Cooperatives in the United States: A Case Study in American Affordable Housing Policy". The American Journal of Economics and Sociology. Archived from the original on 2004-09-29. ^ "Les Babayagas, la silver solidarité au quotidien". Libération.fr. Retrieved 2 May 2015. ^ "Félicitations !". Retrieved 2 May 2015. ^ "Félicitations !" (PDF). Archived from the original (PDF) on 6 October 2014. Retrieved 2 May 2015. ^ "Home - The Sunday Edition - CBC Radio". Cbc.ca. Retrieved 23 December 2017. ^ Kuhnert, Jan; Leps, Olof (2017-01-01). Neue Wohnungsgemeinnützigkeit (in German). Springer Fachmedien Wiesbaden. pp. 33–56. doi:10.1007/978-3-658-17570-2_2. ISBN 9783658175696. ^ Kuhnert, Jan; Leps, Olof (2017-01-01). Neue Wohnungsgemeinnützigkeit (in German). Springer Fachmedien Wiesbaden. pp. 187–212. doi:10.1007/978-3-658-17570-2_7. ISBN 9783658175696. ^ Halva befolkningen bor i småhus, Statistics Sweden, May 7, 2015. ^ "Housing cooperatives in today's Switzerland" (PDF). Current Concerns (11): 11. 12 March 2012. ^ "Development of the housing co-operative sector - CCH Confederation of Co-operative Housing". Archived from the original on 14 July 2014. Retrieved 2 May 2015. ^ "New co-op homes". Cch.coop. ^ "Catalyst Collective". Catalystcollective.org. Retrieved 23 December 2017. ^ "How to set up a housing cooperative" (PDF). Radicalroutes.org.uk. Retrieved 2017-12-10. ^ "MAHC Main page". Retrieved 2 May 2015. ^ "National Association of Housing Cooperatives (NAHC)". Coophousing.org. 18 March 2014. Retrieved 2 May 2015. ^ "National Association of Housing Cooperatives (NAHC)". Coophousing.org. Retrieved 23 December 2017. ^ "North American Student of Cooperation". 12 November 2017. ^ "The Problem of Living in New York" (PDF). Harper's Magazine: 918. November 1882. ^ Sazama, Gerald (January 1996). "A Brief History of Affordable Housing Cooperatives in the United States" (PDF). University of Connecticut. Archived from the original (PDF) on 2006-09-10. ^ a b c Kennedy, Shawn G. (May 21, 1986). "Q and A". New York Times. ^ Garbarine, Rachelle (September 26, 1997). "Residential Real Estate; New Financial Option for Condo Boards". New York Times. ^ Romano, Jay (June 1, 1997). "Condo Boards and Loans". New York Times. ^ Nussbaum,, Jay (April 2007). "Planning for the Unknown: Condominium Borrowing". The Cooperator. ^ a b Carlson, Neil F. (2004). "UHAB Comes of Age: 30 Years of Self-Help Housing in New York" (PDF). UHAB. Archived from the original (PDF) on 2008-10-06. Retrieved 2009-07-15. ^ Allred, Christopher J. (2000). Breaking the Cycle of Abandonment (PDF). NYC Department of Housing Preservation and Development. Archived from the original (pdf) on 2012-02-02. Retrieved 2013-09-15. ^ a b Arsen, David (July 1992). "Property Tax Assessment Rates and Residential Abandonment". The American Journal of Economics and Sociology. 51 (3): 361–377. doi:10.1111/j.1536-7150.1992.tb03487.x. JSTOR 3487318. ^ Smothers, Ronald (April 10, 1983). "City-owned housing units increase". New York Times. ^ Tucker, William (Autumn 1990). "The Hidden Costs of Housing Madness". City Journal. Archived from the original on 2008-10-11. Retrieved 2009-07-15. ^ Wolkoff, Michael J. (1999). Housing New York: policy challenges and opportunities. State University of New York Press. ISBN 978-0-7914-0353-2. ^ a b Preservation and Development, New York City Housing. "Development". Rehabilitation:Tenant Interim Lease Purchase Program. City of New York. Archived from the original on 2009-05-09. Retrieved 2009-07-15. ^ "Buying in a Land Lease Cooperative Building". 2011-03-27. 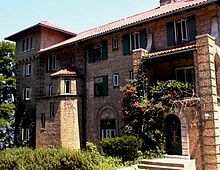 Wikimedia Commons has media related to Housing cooperatives.